My First Visit to a Pig Farm - Did it Smell Bad? - JP loves LIFE! My First Visit to a Pig Farm – Did it Smell Bad? For Earth Day weekend, I had the amazing chance to visit my friend Chris Chinn and her family on their pig farm in northcentral Missouri. Chris & I got to know each other through social media. We had probably talked for a year before we met in person. And ever since we met, I’ve told her I wanted to come visit the farm. Schedules have been crazier than I would have liked so it always seemed it would be next month. By the time Chris, her husband Kevin and I shared the USS Missouri experience I knew I had to make it happen. We finally created a perfect opportunity and I went up there before we headed to the State of Now conference where the two of us took the stage together. I’ll be writing several posts about it, but why not start where most people go with they think of a pig farm… the smell. Yeah, I know there are several things that people think of when they think of pig farms, but I have to think that the smell is the thing that most frequently comes to mind. Its a stereotype but since we all know stereotypes are frequently built on the truth, I assume that I’m not the only person who wondered about the smell. I got there right around dinner time, and since I missed the drive on the road, Chris came down to meet me. We drove up to the house and I saw the dogs kenneled so they didn’t get to the highway. We walked nearly straight out to the deck on the back of the house where Kevin was working the grill (pork steaks were on). And Conner was busy being all boy. We were having a great time just catching up, and getting to know Conner and Rachelle when I realized the pig barns were just up the hill…. not at all what I expected as I hadn’t smelled a thing! Later that night, Chris and I went with Conner as he got the chickens back in their coop. It was probably more than halfway up to the barns and no joke, I still didn’t smell them. They seemed pretty close too. I figured morning chores and my tour would be the rude awakening I had always heard of and that I prepared for by bringing a change of clothes. We did all the feeding rounds for cattle, etc. and then Chris and I went to tour the hog barns. As we went in, I can’t lie, there was a smell that made it clear animals were here. I decided to keep my inhaler with me just in case it got to be a strong smell — that’s a lesson I’ve learned by having reactions to some things. We went on in (I’ll have to write a separate post on that process) and I soon was standing in a barn full of sows and piglets. I was amazed by how clean it was and how little it smelled. Sure, I know there must be times when the smell is much stronger, when they are cleaning barns, when they are spreading manure on the fields, etc. but wow. I was really impressed. The last stop on my tour was the feed mill. We went on over to see how all that was done and headed back to the house to pick up Conner so we could grab a quick lunch so Chris & I could shower & head to Des Moines. As we realized the time, we decided showering first would likely lead to starvation of us or kids, so we picked up Conner and headed to town. You can see what Kevin thought of this at right. Yes, that’s how he greeted us going to town. I promise, he’s usually a friendly guy! Chris explained as we went to town. But you see, for Kevin, you do not leave the farm for town after being in the barns. There is a smell and it gets in your clothes. In town, it could offend someone or give people the impression that farmers are dirty, etc. For me, I was just thinking I’ve been dirtier and stinkier in public having spent a sweaty day at the zoo, park or something. I didn’t see that in small towns, people would be aware of the connection to farms and that may lead to misperceptions about farmers. With that in mind, we carefully picked a table away from everyone else, over in a corner at the restaurant. We all washed up, had a great lunch and got back on the road. Now as to what happened to those hog barn smelling clothes… I’ll leave that to another day too! 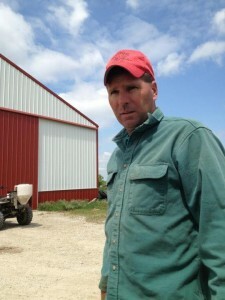 I wrote another post about what it is like in the pig barns. Thought I’d link it here in case you were interested. 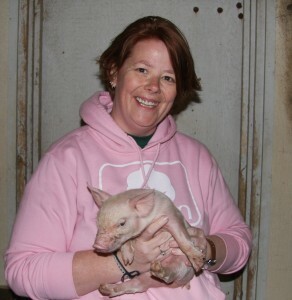 While I have never been to a pig farm, I had a similar experience to you when I went to a dairy farm. Even as my friend and I approached the farm and saw the cows, there wasn’t a smell! Sure, as we arrived, we could smell the livestock, but it wasn’t an overpowering stench like I had expected. These pastured cows were definitely used to attention, and several approached hoping we had food. They soon lost interest when we were empty handed and returned to munching grass. I can’t wait to read more of your pig adventure! Thanks Tammy! I think lots of us get the wrong impression on smells associated with farms. I have wondered when driving by some now and then, but now I kind of think those were exceptions and must have been doing something specific that day or something! Great blog post Janice! Looking forward to continuing to read your posts about your trip to Chris’s farm. I was wondering if the pigs on the farm you visited were kept in gestation crates? I saw a horrible video on these crates. I always thought pigs roamed freely among other pigs in pens where they could wallow in mud, until they were older, then sent off to to be processed. I was very upset over seeing the pigs crammed into tiny gestation crates from birth till the day they were to be shipped to slaughter. I read some of your blog entries, and everyones talking about the smell? I know smell is a good indication of proper care, but I was wondering if you saw how the pigs were housed inside the barns? Thanks for stopping by. The farm I’m talking about does use gestation crates though I thought they looked more like individual pens. The ones I’ve seen on videos have been scary in how small they are, etc but this was a bit different. The pigs all had a bit more room thought I still wouldn’t call the stalls spacious. – Pigs wallow in mud because they don’t have sweat glands so that’s really one of the few ways to keep cool in the heat. This farm I was on had them in barns with great aeration, fans, etc. – Pigs can be really mean. This one makes sense to me once I thought about it though as I lived in the Mississippi Delta a while and know of several folks who came up on a wild hog while out in the woods…. some got away finally and others had injuries. So having a lot of pigs in a shared area can be pretty ugly with the big ones showing they dominate. – The mothering instinct is different in different animals. I know that they have larger numbers of babies which could have something to do with it but it seems a lot of farmers have had sows step on piglets. For this reason sows are kept in something called farrowing crates with the piglets having room on either side. I hope that helps you know my experience… I may write more though since you got me thinking! I am the farmer who Janice is referring to. The sows are not housed in the individual pens their entire life. They are only housed in the pens when they are pregnant. From birth to breeding they are in group pens. Sows (female hog that has given birth) are used for breeding purposes so they are cared for differently than a market hog that is raised for pork consumption. Market hogs are housed in group pens their entire life. Because of a sow’s dominate nature, especially while pregnant, we house the sows in the individual pens to protect them from bully sows and fighting. The bully sow starves out the less dominate sow and over eats. This results in pigs too big to pass through the birth canal. The sow normally dies during the birthing process when the pigs are too big. If she survives, she normally gets an infection from the tearing during birth. The less dominate sows will give birth to stillborn pigs or unthrifty pigs due to lack of nutrition during the pregnancy. The stalls allow us to tailor the care for each sow. We can tailor each sows feed to fit her nutritional needs. The stalls also allow the sow to lay down and relax without being stepped on by another sow. One reason farmers have moved their hogs indoors is because today’s consumer wants lean pork. This means the hogs have less body fat and they have difficulty staying warm in the winter months. Another reason farmers moved hogs indoors is because as Janice said, hogs can not sweat. The climate inside our barns is like the air conditioning in your home or office. Hogs also sunburn which hurts, so housing them in barns eliminates this problem as well. 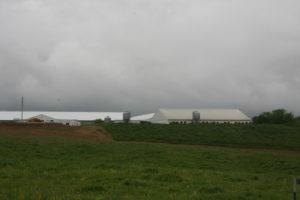 The barns also protect the hogs from predator attacks and diseases carried by wildlife and birds. As a result, we use farm less medication today than we did 30 years ago when our hogs were on dirt lots. We also no longer have to worry about parasites that come from dirt lots. Trichinosis has been eliminated from the US hog herd which means pork is safer today than ever before. This is one reason the USDA lowered the cooking temperature for pork to 145 degrees. I hope this has helped clear up some of the questions you had. Chris, this is such a great reply to Kylee’s question. I recently started working for my husband’s family business selling hog feeders, and a lot of my friends ask about this. Love your blog, Janice – thanks for sharing your stories. I usually did not like to visit pig farms and so I have never visited it. I think you had a nice experience visiting pig farm. What you say?